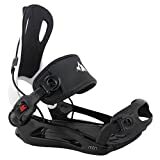 Bindings are like the joint between your boots and the snowboard, it is very important that you get the best snowboard bindings brands if you want to have the best experience as your snowboard. That turn or jump will be successful depending on the bindings you have. There are certain aspects that you need to pay attention to as you make your choice. The experts will tell you that the ratcheting system this makes the difference between being among the first to be ready to go down the hill or always being the one they have to wait for. You will also want to consider comfort as well as flexibility. For some people what the binding looks like is also important but we would advise that safety and performance be given the main attention. We also advise that you do not buy cheap ones. Now after a lot of research, we have come up with the top 10 best bindings brands in 2019and starting from number 10, here they are. Their bindings use the same material throughout which makes them more flexible. They are compatible with other boards, not just the Burton boards. Since they are made from nylon, they are a lot lighter than the metallic ones making manoeuvring easier. User reviews mention that the straps are high quality and easy to adjust to fit your shoe size. While on the mountain, it is quick and easy to adjust the straps without worrying that they may break. One person, however, complained that they had to buy a 3 hole mounting disc to fit their old style 3D Burton board. This is an easy to use pair of bindings with great responsiveness. The 4mm heel baseplate gives women that lift for a natural feel on the board. There is good grip of your boot which improves the communication between boot and binding for better flow. Some customers appreciate the elastic band on the back which gives room for adjustment without losing grip. Since it is lightweight, it has good flex. All in all, it is satisfactory for both greenhorns and experts. You are going to find mixed reviews about these but the best thing is to try them yourself. Our general opinion on them is that they are comfortable and made from light material. When it comes to performance, they handle quite well and get the job done. We would not recommend these for first timers because you may find strapping up a bit tricky but once you have been shown the trick behind getting them on, they are pretty smooth and you will be waiting for your friends to strap up because for you it will be fast and easy. The highlight of these bindings are the 360 Asym highback. It is impressive how it is able to give firm support as you take on the most daring slopes and curves and yet they still are flexible enough to be comfortable and allow for easy movement. They are binds you can use anywhere and achieve great performance. The channel adjustment allows you to adjust it to fit your boot size perfectly. Some people say they are performance enhancers. We would confidently recommend these for both experts and first-timers. The rear entry design makes getting in and out of these very easy, you do not even have to sit down to strap up. It is also compatible with different boards thanks to its multidisc base plate. When it comes to durability, the MTN scores highly thanks to the polyurethane covering. Customer reviews of this are all praises for the ease of getting them on as well as the comfort they provide. You may need to get used to them but once you do you will love them and you will be able to strap up in just a few seconds without having to sit on the bench to do it. These are good for new snowboarders who are ready to move up a level with their snowboarding. The flex is quite responsive to movement making it easy to make those twists and turns. It has dual entry system which makes it easy to get in and out of the binding. Like an exoskeleton, it provides perfect support, especially for your ankles. Customers like these bindings and note that they provide a smooth ride. There is, however, a complaint about them not being so great in thick snow as the front strap tends to get flipped up because of the design facing down. Other than that, they are great. These are tough bindings for just about any terrain. They have bombproof construction to give you better control riding tool-less. Its easy to adjust and give you a good level of comfort. They give you the ability to execute the hardest shredding you have ever done with ease. Customers like the highback which provides great support coupled with reasonable flex. All in all, these are great for a rough ride as well as normal riding. Flow is one of the big brands in snowboarding and this is their best model. It provides perfect exo-support, great comfort and easy wearing. The high back is a feature that many snowboarders like because of the support and comfort it gives. The hard outer cover helps to provide support as well for the ankles. Although experts do not think its flex is very good, most customers who have used it say they are happy with its performance. These are the best bindings for women, providing highback support and great toe grip straps. If you care a lot about how you look as you snowboard, these are also fashionable especially since they come in purple which draws attention. 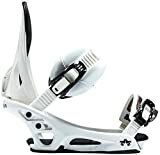 In the words of one of the customers, “these Burton stiletto bindings have you feeling comfortable, secure and stable. It also helps that they are reasonably priced. These are the overall best bindings. Burton tried out a number of new things with these and they were right on the money. The soft base with harder edges provide not just comfort but also responsive support. It also reduces the weight on the board for a smoother swifter glide. They are easy to get on and off and they keep you safe. They are definitely worth the money and you would have great fun with them. When it comes to bindings, you should not be shy to spend, cheap ones in most cases will end up being a big disappointment unless you are planning to give up the sport after a few falls. A good and reliable pair comes at a cost and you should be ready to meet it. Burton and Flow are the biggest brand names when it comes to best snowboard bindings in 2018. The Burton Cartel Est are our best recommendation for men, while the Burton Stiletto are the best recommended for women. You can, however, make a choice of any of the other top 10 and you would still have great and reliable bindings.